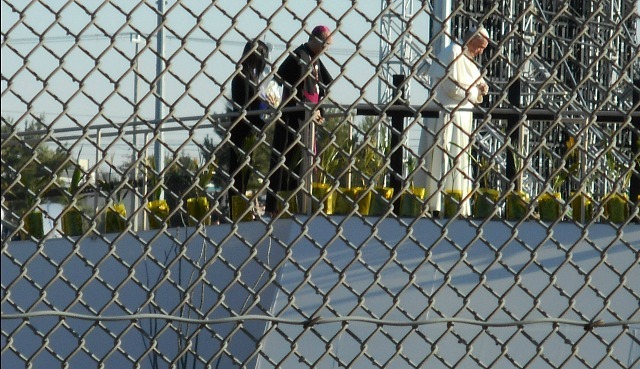 AT THE US-MEXICO BORDER, EL PASO – When the visit of Pope Francis to Mexico reached its close with his February 17th Mass at Ciudad Juarez, I could’ve had the privilege to cross the border and concelebrate with him. Instead, however, I chose to remain on the Texas side and take part in this historic “liturgy of two nations” with a large number of undocumented people who could not legally cross over to join our Holy Father, but who were able to witness the moment as the first son of immigrants to become Bishop of Rome stretched his hand over the Rio Grande to bless them on US soil. It was an overwhelming experience! But before that memorable Wednesday afternoon, I was blessed to spend time with a large number of young people who were present as “unaccompanied minors” – a nice way of saying that they had endured weeks and months of anguish, attacks, deprivations, and threats to reach our country. 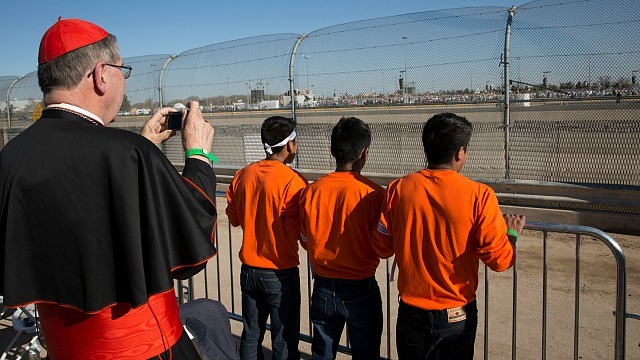 I met with about 40 of them in El Paso before the Pope arrived. The majority were from Guatemala, Honduras and El Salvador. These were young men, 16 to 22 years old, but they all looked like children. When I asked them to tell me their stories, they told me of how they had been sent on their journeys alone by their parents, because the options for them back home were so bleak. If they didn’t take the risk to seek a new life elsewhere, they said that all of them would have been forced into criminal gangs in one way or the other, and they would have been made to kill and maim others for the survival of the gang. It’s frightening when the only future ahead of you would be to capitulate to the horror and the treachery of lawlessness in your homeland. Instead, the parents of these men were strong enough to force them to leave behind everything they knew, and to travel “al norte” – to the north – in the hope of something better. At great sacrifice and with a lot of money – money they couldn’t afford – they sent their sons and daughters across the the only possible route to the US: the border between Guatemala and Mexico. It was a moving grace to meet with these courageous young people, to come to know them, and to listen to their stories. The only way they survived traveling north through Mexico was meeting one or two others on the same journey. As they described it, they became compadres – brothers and sisters on a common journey – and endured incredible obstacles: drug lords controlled most of the territory they had to travel, and they were attacked, threatened, and humiliated every mile of the trip – a journey of many weeks. Often, and in more ways than one, they faced death, whether from trying to jump onto moving trains or from a lack of food and water. But the most frequent, and painful, reason why their lives were in danger was the lack of anyone who cared for them. 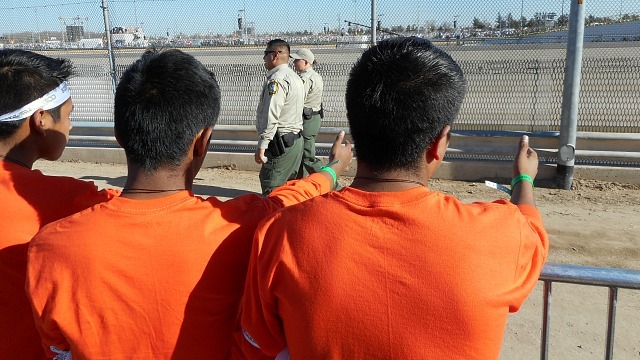 These men arrived at our border not as criminals, but as desperate souls and children of God. All they came seeking was a future free from the crime, injustice, and slavery of being pawns in an empire of what Pope Francis calls “modern slavery”: the twin evils of drug and human trafficking which are destroying countless lives and communities in Central America. In the 25th chapter of Matthew’s Gospel, Jesus tells us that “whatever you did for these least brothers of mine, you did for me,” and by that standard we will be judged. Today, what we do for these men and those like them is what we do for the Lord himself. It was a special grace to be with these sisters and brothers of ours on the border, within eyesight of the Pope’s final Mass in Mexico. We may have been physically divided from Juarez by the pathetic Rio Grande, guarded by the Border Patrol officers everywhere around, but in something no human obstacle can restrict – the Eucharist and the love of Christ – we were one. I returned to Los Angles with a renewed enthusiasm to walk the journey of peace, fraternity, and well-being for all of our brothers and sisters who have endured, and are now enduring, the fences that separate us. May the Lord, and Our Lady of Guadalupe, Mother of America, bless and strengthen us in our task.